This week my son and I bought our first house together. I’ve experienced so many feelings and emotions in moving from the last place we ever lived with Desreen and I have so much to say about it. However, at the moment I have neither the energy nor the broadband (it’s killing me) to share too much. Just one small thing occurred to me as I unpacked our pictures and began to contemplate where to place them. For now this is simply a house and it’s going to take a long time before it feels like a home. 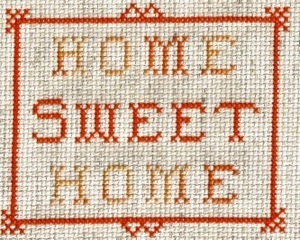 I could lie to myself and hang the old cross-stitch ‘Home Sweet Home’ picture but, right now, a truer tapestry from my heart would read ‘Home Bittersweet Home’. A sweet dream we had as a family but only realised in the bitter absence of the woman we love. A new house, a sort of new beginning, a venture into the unknown. Best of luck, Ben, in the new house. I’m glad you didn’t follow my advice 🙂 May you enjoy it as much as I love my new apartment! Love is filling your home. Desreen will always be with you and Jackson as you begin this new chapter in your life. Burn some sage with Epsom salts in a brass bowl and walk through each room singing YOUR song. It all helps and is beautifully calming. Wishing you and Jackson peace and happiness together in your new home. A friend gave me the link to your blog. My husband died on 28th November from a massive first heart attack, and I have three children – twin girls aged twelve, and a ten year old boy. Although our personal circumstances are very different, I feel everything that you have written. The overwhelming emotion that is at the forefront of every waking moment for me is the heady responsibility of raising my children alone. I am fortunate in that my children are at an age where we can, and do, talk about their dad, and it’s no longer just making me feel sorrow. You’re spot on that writing is therapeutic. I am sending you and your son my heartfelt best wishes. Your words are inspirational. This entry was posted on April 21, 2013 by Ben Brooks-Dutton and tagged grief, home, house, pictures.